This picture is beyond creepy, but it was the only one I could get the last time I was “up home”. 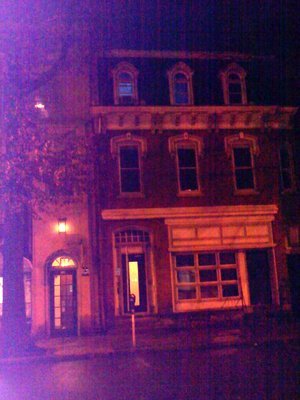 We lived on the third floor (where the blue light is glowing) from 1999 to 2001. I loved that apartment. I loved climbing up the creepy back staircase. I loved being able to sit in the tub and look out, well, onto my porch and the alley way. Still it was a great view and so different from what I was used to. It had its problems. Trust me. This apartment was not updated at all. Not even to 1999 standards! The list of how not updated overshadows how great an apartment it was so I’ll just leave it alone. We lived right downtown. That was pretty cool for me. I loved being able to walk around instead of having to take the car everywhere. We lived across the street from the Genetti Hotel and Suites, Williamsport’s version of the Waldorf. Next to the Genetti is the Williamsport Cultural Arts Center where a lot of concerts and such took place. (I saw and met Pat Benetar there!) Two streets down is the Community Theater League. There is also a great park just up the street and my church was literally behind my building. I LOVED living downtown. I LOVED living in an old building. I LOVED living in the building that quite possibly housed an office my grandfather worked in decades ago (we were never sure and some family said yes he worked there and others just weren’t sure). I LOVED waking up at 3 a.m. because the street lights were bouncing their orange glow off newly fallen snow. To me this was a particularly joyful thing. At 3 a.m. no one had driven on the snow or walked on it and it looked like a magical winter wonderland. By the time I left for work it looked…lived in. I never begrudged the mornings I was woken up that early just to catch the fresh snow before it was muddied by us humans. I don’t think I realized it then because I had a lot of worries on my mind then but I felt so chic living downtown and walking places. I hope to have that experience again. This entry was posted in random crap and tagged Genetti Hotel, Pat Benetar, Williamsport Cultural Arts Center. Bookmark the permalink.